From Producer-director-writer Stanley Kubrick comes this popular comedy that's sometimes hard to laugh at because it hits too close to home. No effective plot synopsis can be written for such a lunatic yarn, but here are a few highlights. SAC General Jack D. Ripper (Sterling Hayden) goes bananas and sends a group of B-52's to bomb Russia, blaming the Commies for a variety of America's problems (including fluoridated water). If the bombs are dropped, the Russians will retaliate, so President Peter Sellers calls a meeting of his advisory, including ex-Nazi Dr. Strangelove (also played by Peter Sellers), who must grab his right hand whenever it habitually flies up to give a Nazi salute. The Russians succeed in stopping all the planes except the one piloted by a blustery Texan, Major "King" Kong (Slim Pickens), who dons his ten-gallon hat and literally rides his A-bomb down to Moscow. President Sellers' is shocked by the apparent madness of his own military advisers: they blithely discuss "acceptable losses" in the millions while they debate the male-female ratio in the top-brass fallout shelter. The closest thing to a sane person in the whole story is a British officer named Captain Mandrake (also played by Peter Sellers!). 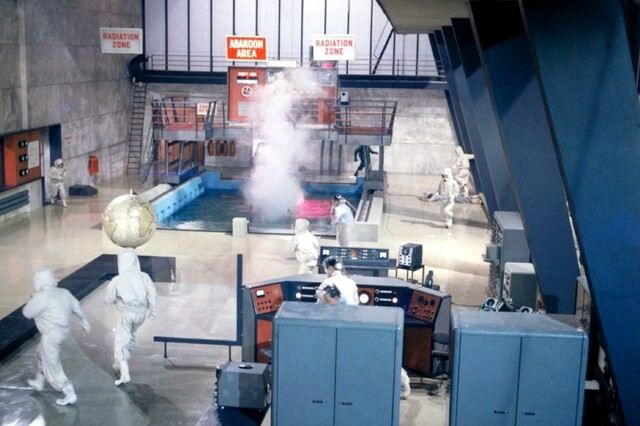 Captain Mandrake watches in wide-eyed amazement as Colonel "Bat" Guano (Keenan Wynn) shoots holes in a Coke machine because it won't give him a soft drink. The cast also includes George C. Scott, Peter Bull, and James Earle Jones. 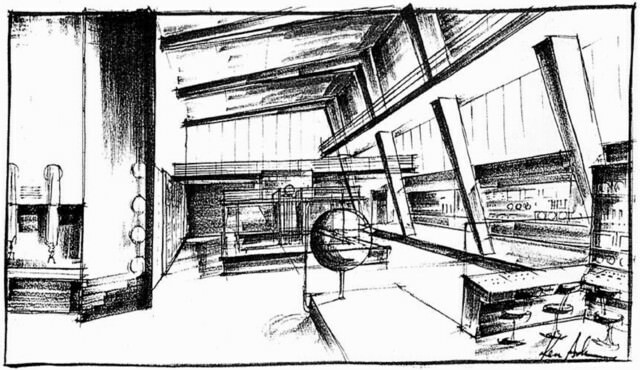 Great set design by Ken Adam. "Dr. Strangelove" seems to be Stanley Kubrick's way of telling mankind to grow up. "2001" is, in a sense, the second half of the statement begun by "Dr. Strangelove" -- as if Kubrick is saying, "This is how were are (Strangelove), and this is how we should be ("2001")." Actually it was Captain Mandrake who told Colonel Bat Guano to shoot the lock off the Coke machine -- to get change so he could make a pay phone call to the President. "OK. I'm gonna get your money for you. But if you don't get the President of the United States on that phone, you know what's going to happen to you? You're going to have to answer to the Coca-Cola Company." I love how the colonel's obsession with "preverts" (sic) just comes out of left field. The geopolitics may be dated, but the satire is as sharp as ever. 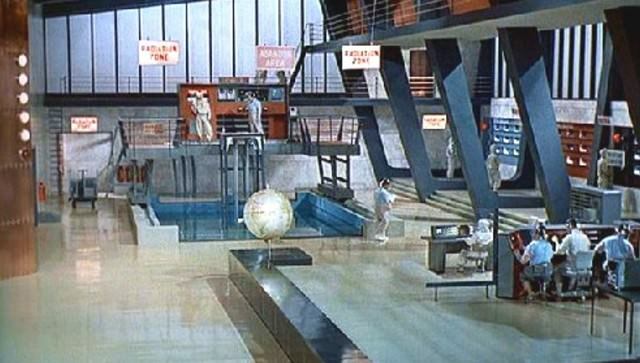 Oh, and the set designer is Ken Adam, who's best known for his work on the earlier James Bond films. Thanks, Scotspen! I've corrected Mr. Adam's name. I left the other error about the Coke machine in the review because if I change it then your reply would look like a correction for a mistake I didn't make! I haven't seen the movie in years, and I wrote the review based on reference books, so I must have misread something, or one of the sources I used made a mistake. 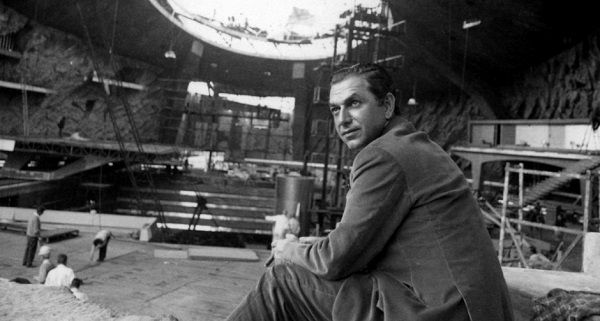 "Ken Adam, Who Dreamed Up the Lairs of Movie Villains, Dies at 95"
Butch, that's a beautiful gallery of pictures from the Bond films. 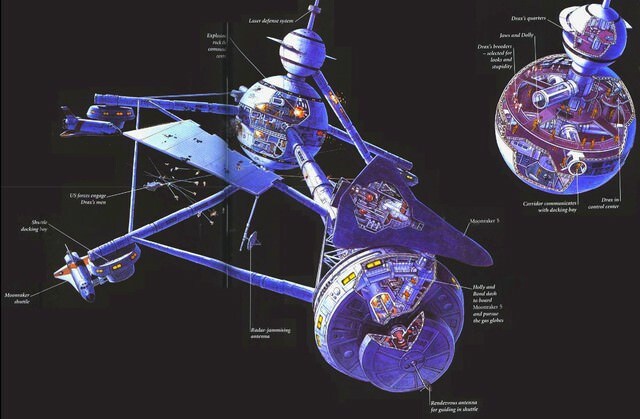 It really demonstrates just how talented Ken Adams was and how his futurist designs have thrilled science fiction buffs for decades. Thanks for posting them. P.S. Custer is right. The man with Sean is Ian Flemming, according to the caption under the same picture at the site below. Butch, that's a beautiful gallery of pictures from the Bond films. Question: Why are they posted in the Dr. Strangelove thread? 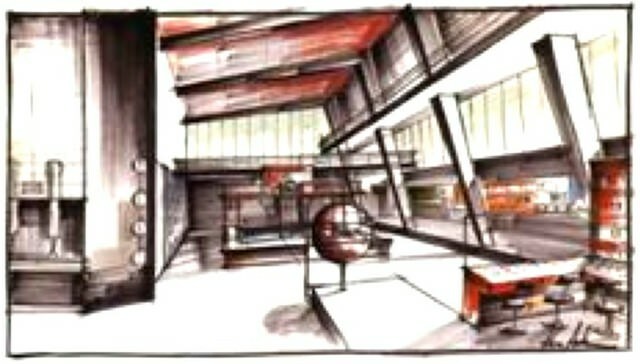 Great set design by Ken Adam. 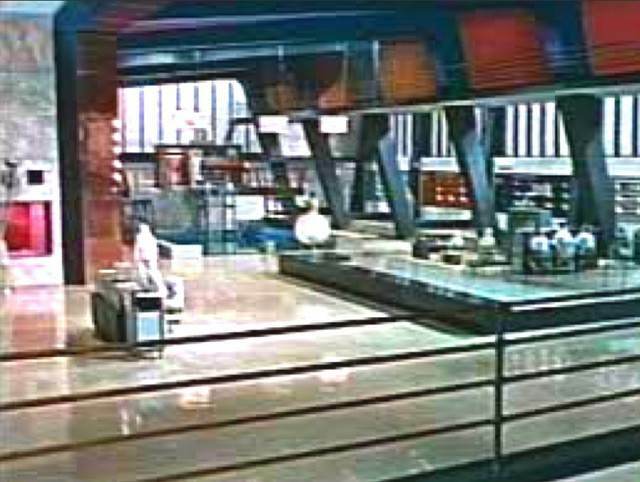 And Butch shared the great pictures of the sets Ken Adam (the guy I mention) designed for the Bond films (which Scotspen mentioned). And that's why the pictures are on the Dr. Strangelove thread. The pictures were taken from an issue of Architectural Digest. It labels the person as Ken Adam. Okay. I just needed to go back and re-read the whole thread from a year ago to make the connection. Okay. I'm sorry to hear about Ken Adam. His ingenuity gave movies like Strangelove and the Bond films that big screen better-than-reality feel that movies so needed in the '60s to pull audiences away from their TV sets. I'm not surprised that AD got the name wrong, but Butch? 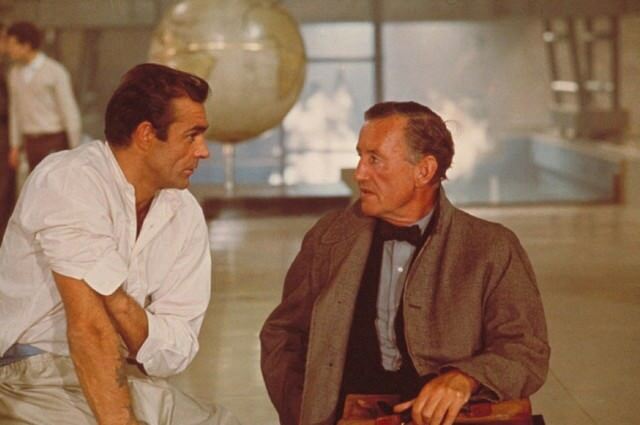 Connery and Fleming are two of the most identifiable figures of mid-century culture for me. I've only seen Adam's pic a couple of times, though. As I recall there's a book out on his work I've always meant to get around to. I know it's impossible to ever name THE best or THE worst of anything. 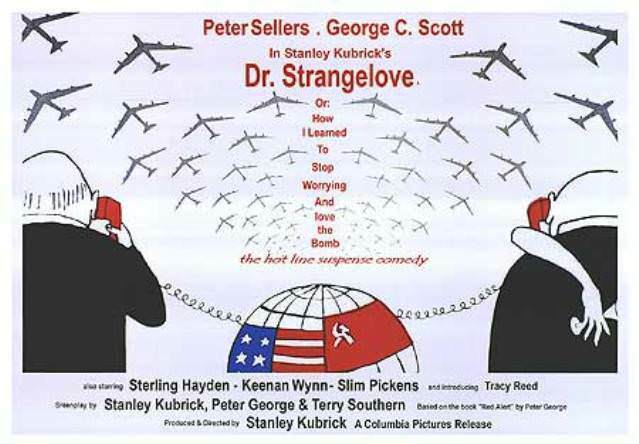 But when somebody presses me to name the best film I've ever seen, I always say -- after first explaining that it's impossible to really give such an answer -- that DR. STRANGELOVE is the greatest movie I've ever seen. I waver from time to time...CITIZEN KANE? LA GRANDE ILLUSION? THE SEARCHERS?...BRIDE OF FRANKENSTEIN?... I always come back to this virtually flawless, frighteningly hilarious, masterpiece. I read years ago, that Steven Spielberg kept a copy (a tape, I assumed) of DR. STRANGELOVE on his bedside table. Whenever he felt muddled about just what a great movie was supposed to be, he'd pop Kubrick's film into the machine. And then he'd know. Back in the 80s a group of us went see DSL at a revival theater. After the movie was over another group crossly informed us that our laughing had ruined the movie for them! Apparently, they were under the impression that the movie wasn't a comedy. They didn't appreciate me asking them that. The other day, I was thinking that Dr. Strangelove is history's greatest movie for one-liners ("No fighting in the War Room..." etc.). But there is one little throw-away line that is my favorite. As a pilot myself (many years ago), I still get the biggest kick from hearing Maj. Kong saying, "How many times have I told you guys I don't want no horsin' around on the airplane".